Who wouldn’t want a higher level of emotional intelligence? 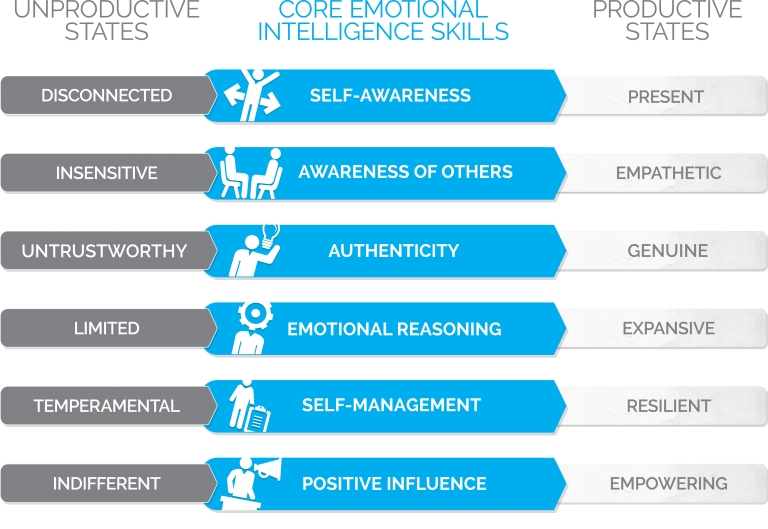 Studies have shown that high levels of emotional intelligence boost career success, mental health, relationship satisfaction, humour, and happiness. Higher levels of Emotionally Intelligent Workplace Behaviour is also the best antidote to work stress and building your personal resilience. So can you improve your emotional intelligence and how best is this done? The competencies of the model below help us consistently demonstrate the productive being states on the right side of the model, as opposed to the unproductive being states on the left, that we can all be at times. For instance, the skill of Positive Influence helps people create a productive environment for others. Positive Influence equips you with the capacity to encourage colleagues to cooperate and work effectively together. People who can positively influence others’ moods, feelings and emotions are empowering to work with and easily motivate those around them. The Genos Emotionally Intelligent Workplace Behaviour survey measures how well you demonstrate emotionally intelligent workplace behaviours in comparison to others. The better you demonstrate the behaviours measured, the more effective your relationships and work should be. This assessment is designed for introductory workshops, conferences or front-line employees. This individual assessment report presents how well an individual believes they demonstrate emotionally intelligent workplace behaviour, and how important they believe it is to do so. This report presents how well an individual demonstrates emotionally intelligent workplace behaviour, how important it is to colleagues that they do so, and qualitative comments from raters. This report presents how well an individual demonstrates emotionally intelligent workplace behaviour, how important it is to colleagues that they do so, and qualitative comments from raters. Customisable rater categories are used to suit the vernacular your people are familiar with. Benchmarked results provide a comparison with others self-assessed results and the report outlines the type of behaviours associated with being emotionally intelligent in the workplace. Raters provide free text responses for each competency assessed. These are captured in the Feedback Report and help understand the context behind rater responses to assessment questions. A traffic light methodology highlights areas of potential strength and development.